Two young performers from Newton Aycliffe have been offered a once-in-a-lifetime chance to attend a prestigious Hollywood dance school. But the teenage sensations need to raise cash to help fund their dream summer trip. 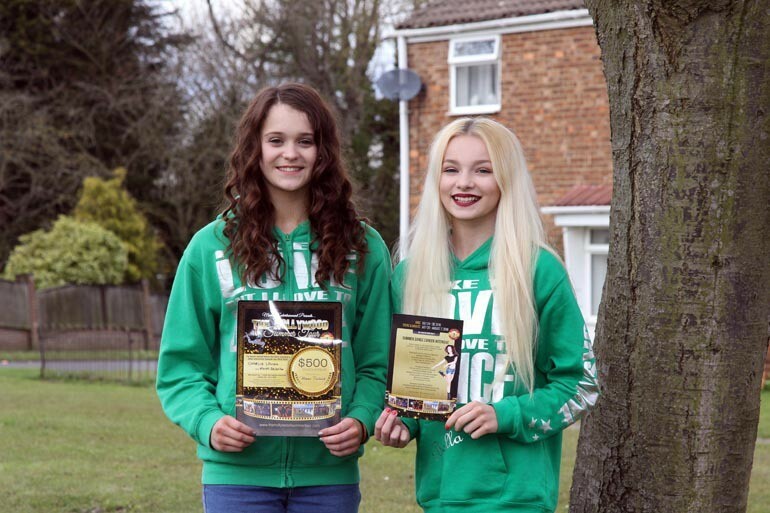 Woodham Academy student Charlie Lough, 15, and 14-year-old Emily Halford, who goes to Greenfield College, have been offered a prized place at The Hollywood Summer Tour in Los Angeles. The pair impressed talent scouts at the ‘Move It’ Dance Convention at London’s Excel, performing with their dance school, Stepping Out with Clare Walton. The purpose of the weekend was for the girls to attend lectures with famous choreographers, talk to colleges, watch performances from top colleges and dance schools and basically to just have fun. But both were then offered two amazing opportunities. Charlie’s Mum, Natalie, said: “Charlie and Emily have both been fast tracked straight to the live heats of The UK Dance Elite Championships after being spotted by talent scouts. “They have also been offered an invitation to attend The Hollywood Summer Tour in LA, which takes only 20-30 dancers from around the world. Emily – who started her career with Aycliffe’s Lee Green Dance School – was spotted whilst taking part in a Karen and Kevin Clifton Latin Lecture, while Charlie took part in the ‘Freestyle Stage’ which was open to anyone and won the whole event, beating well known televised dancers. Their performances have attracted thousands of views on Facebook. Now their parents are appealing for people and local businesses to help fund the pair’s state-side trip, which is expected to cost about £8,000 for both of them – and has to be paid by June. Emily’s Mum Catherine added: “Our first step is that we are going to hold a Hollywood Disney Princess and Hero themed party for local children and try and organise a large raffle.